- Echo Plus has a built-in Zigbee hub to easily setup and control your compatible smart home devices, and an improved sound for streaming music. - New premium speakers powered by Dolby play 360° audio with crisp vocals and dynamic bass response. You can also use your voice to adjust equalizer settings or pair with a second Echo Plus (2nd gen) for stereo sound. 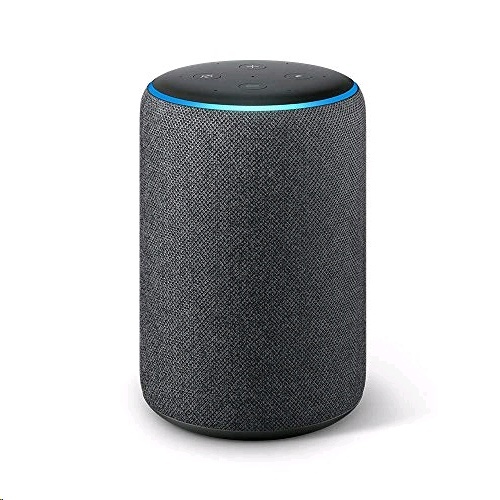 - Ask Alexa to play music, answer questions, read the news, check the weather, set alarms, control compatible smart home devices, call almost anyone, and more. - Set up your smart home without a separate hub. Ask Alexa to control compatible smart lights, switches, sensors, door locks, and more. Echo Plus also includes a built-in temperature sensor. - Ask Alexa for a song, artist, or genre from Amazon Music, Apple Music, Spotify, Pandora, SiriusXM, and more. With multi-room music, play music on compatible Echo devices in different rooms. - Call or message almost anyone hands-free. Instantly drop in on other rooms in your home or make an announcement to every room with a compatible Echo device. - With seven microphones, beamforming technology, and noise cancellation, Echo Plus hears you from any direction�even while music is playing.